The United Nations Industrial Development Organization and the International Energy Agency are developing a Global Technology Roadmap for CCS in Industry (the Roadmap), due to be released mid–year. The project has been sponsored by the Global CCS Institute and the Norwegian Ministry of Petroleum and Energy. The Roadmap will be a valuable resource to stakeholders, including policy makers and regulators across the globe. 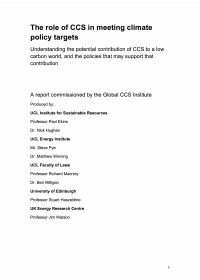 Targeted at policymakers, the Roadmap will be a high-level assessment of the key actions and milestones that need to be undertaken to develop CCS in industry. Organisation(s): Inc., Japan Petroleum Exploration Co., JGI, Ltd. This paper describes the use of interferometric synthetic aperture radar to map changes in the surface of the Krechba natural gas field at In Salah, Algeria. The authors state this this is the first instance the spaceborne system has been used for this purpose. They describe methodology and results, concluding that this system is a promising, cost-effective monitoring tool compared with other conventional geophysical surveys.